The stone linga-yoni couple was found buried underground in a Hindu-influenced tower on a hill about 50 meters high above the ground level in 1985. They were excavated in 1999. Archeologists believe the ruined architecture was built in the 7th-10th centuries. Also discovered were a stone statuette of Ganesha, bronze lingas and yonis, many gold pieces carved with the deities Brahma, Vishnu and Shiva, animal figures, tridents, spears, pieces engraved with Sanskrit and other artifacts, at a depth of 3.56 meters. However, today all that remains on the archeological hill as evidence of a brilliant civilization in the past are the linga-yoni couple and the ruins of towers. There are no documents about this site, although archeologists believe the main temple used to face to the east and measure 18 meters high. For anyone who is interested about where the findings are now, the management of the Cat Tien group of archeological sites says the artefacts are on display at the Lam Dong Museum in the resort city of Dalat. Located at the Cat Tien archeological sites are other ruined temples where people in the past came to pray and worship. Excavations from 1994 to 2001 resulted in the finding of many precious artefacts, including stone columns and lintels with different motifs, gold pieces carved with deities and the old language Sanskrit, ceramic and tile pieces estimated to have been made in the 7th century. 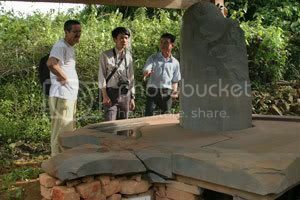 The group of Cat Tien archeological sites is accessible by traveling 60 kilometers on winding and sometimes bumpy roads from Cat Tien National Park. This park covers nearly 72,000 hectares in Dong Nai, Lam Dong and Binh Phuoc provinces, and situated about 150 kilometers from HCMC. For further information, contact the ecotourism center of Cat Tien National Park in Tan Phu District, Dong Nai Province. Tel: (061) 366 9228/ 330.